USB Network Gate for Windows lets your computer work with remote USB devices over Internet/LAN/WAN as if those devices were connected directly to this computer. You can share a USB device with remote computers no matter how far they are and let people all over the world use them easily. For example, you may have several computers (Mac, Windows or Linux ones) that run programs that use the same USB security dongle for authorization. The constant plugging and unplugging of the dongle is not only annoying, but brings a good chance of damage (the dongle is getting loose). With USB Network Gate for Windows you have the dongle shared among multiple computers with no need to plug and unplug it constantly. The only USB Network Gate for PC (former USB to Ethernet Connector) released! Now you can share USB devices over the network between Macs, Windows PCs and Linux computers. Doesn't matter if you are in other country or in next door office, you can always use remote scanner, printer, webcam, modem, USB dongle or anything else as if they were connected directly to your computer. When developing an iOS app you constantly need an iPhone/iPad to be connected to more than one computer involved in testing and development. With USB Network Gate (USB to Ethernet Connector) you can connect your iOS device via USB to Windows or Mac computer and share it with other Mac, Windows, or Linux computers involved in the development as if it was connected to each of them directly. Keep your mobile device data up-to-date! Travel a lot and can't sync your iPhone / iPad data with main computer? Use USB Network Gate by Eltima Software to create secured USB over Ethernet tunnel to sync your iOS device with remote computer no matter how far it is at the moment! You can plug your iPhone in a Mac or Windows computer and sync it via local network or Internet with the remote side. You may need to use virtualization programs with Windows OS for certain software that is only Windows compatible. 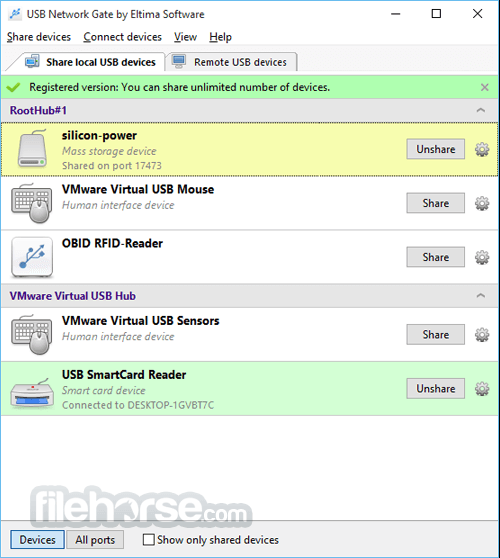 At the same time, you need the virtual machines to access the USB keys (dongles) at the remote computer. It may sound tricky, but is solved in a simple manner with USB Network Gate. Just install USB Network Gate on both host and guest OS (Windows, Mac, or Linux - doesn't matter) and access USB devices connected to a host machine inside the virtual session. If you need to use USB devices plugged in your computer while you are working in remote session, USB Network Gate is the perfect solution. To access USB over RDP you’ll only need to install USB Network Gate on your local computer (that will be Server module) and on a remote machine (client module). Both modules are included in one instance of the application, which is easy to install and use, just as if the USB device was physically plugged in a remote machine. Note: 14 days trial version. You can share only 1 local USB-device.